Hand Guns, Springfield Weapons, Sig Sauer Pistols and others at Dave's Pac West GunSmithing.com! Personal weapons have long been a hallmark of United States history, and that is not going to change any time soon! Winchester, Smith & Wesson, Marlin, Mossberg, Stevens, Savage, all, a staple in the gun industry for countless years, Beretta, one of the oldest corporations in the world, founded in 1526. - Springfield Armory, producing one of the most reliable Weapons in WW2, and the M1 Garand, and last but not least, Ruger! My guarantee is better accuracy with a clean gun. I hold an FFL dealer's license, and am a member of American Gunsmithing Association, Gun Club of America, National Shooting Sports Foundation, and NRA. 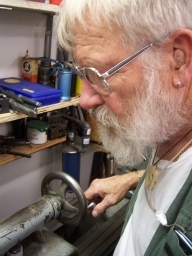 To take advantage of our gunsmithing services, ship your firearm To Dave's Pac West Gunsmithing. I am not a stocking dealer, but can order up just about any weapon you want.